Julian Club Hotel is a 5-star, family-friendly property situated in the beautiful beach resort of Marmaris in Turkey’s Turquoise Coast. The hotel has 2 restaurants, 4 bars and 2 large swimming pools. The rooms of the hotel come in as many as 6 categories, making them suitable for families of all sizes. There is a kid’s club, where your children can meet other kids from different cultures and make new friends. To add to the experience of luxury and comfort, the hotel houses a fitness centre and a spa, where you can work out or indulge in relaxing massages. The hotel organizes fun-filled sporting events, evening entertainment and leisure activities to keep its guests entertained. If you’re looking for an all-inclusive accommodation that is centrally located in Marmaris, Julian Club Hotel is the perfect choice. Located 1.5 km away from the resort centre of Marmaris, Julian Club Hotel is minutes’ away from all the major tourist attractions of Marmaris. The beach and the main strip are barely 1.5 km away from the hotel. Nearby attractions include Aqua Dream Water Park, Atlantis Water Park, the Marmaris Amphitheatre and the Karacan Point Center. The hotel is 90 km away from the nearest airport, Dalaman. 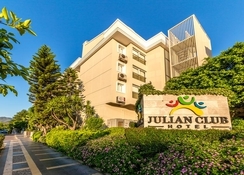 All the rooms and suites of Julian Club Hotel are divided into six categories: standard room, family room, deluxe room, junior suite, penthouse suite and family suite. The modern, elegant and spacious rooms are equipped with LED TV, satellite TV service, mini bar, electric kettle, safe deposit box, private bathroom, work desk, couch, telephone and Wi-Fi service. 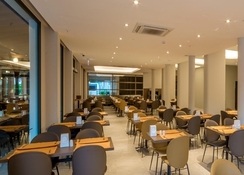 Julian Club Hotel has a buffet style restaurant, the Loryma, which serves breakfast, lunch and dinner. 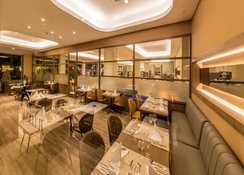 The O’live a la carte restaurant dishes up select specialities prepared by the chef. For alcoholic and non-alcoholic drinks, guests can head to the lobby bar. 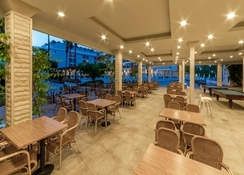 Knidos Snack Bar serves hot snacks and beverages, while the Physkos Bar offer a selection of cokctails and drinks. Guests can also enjoy a drink or snack at the pool bar while taking a dip in the swimming pool. Julian Club Hotel has two outdoor pools. One of the pools come with 2 slides. Tons of fun games and activities are held around the pools. Other recreational facilities at the hotel include water gymnastics, darts, pool games, water polo, beach volleyball, table tennis, basketball and so on. For the kids there’s a kid’s paddle pool, a kid’s club, mini disco, animation shows and an internet café. The spa and wellness centre offers Turkish bath, massages, sauna, steam bath, Thai massage and other relaxing massages. The hotel's entertainment team organises daytime sporting activities, pool games, nightly entertainment shows and much more. We spent a wonderful time at Club Julian, it was our 3rd visit to this hotel. All staff from housekeepers, to bar staff to receptionists to the entertainment team were great and very professional. The entertainment team make you feel very welcome and part of the Julian family. We love where the hotel is located and easy access for participating in excursions. After a 10 day stay at this hotel I can say we would be happy to go back,with fantastic staff, lots to do and with a child friendly atmosphere this is perfect for a family hotel. The food was great and service was second to none.The water slide only came on about twice a day for an hour each time and if you want internet you will have to pay extra for it. Had a great holiday. Animation team the best. Food/drink plentiful. Room clean & ncely furnished, only downside is no free WIFI anywhere & air con unit too low on balcony making it too hot to use! !